Made from 99% recycled material, The Kyowa Filter Unit Rockbag is a flexible bespoke net system filled with stone which can be used to protect marine structures and riverbanks against the phenomenon known as scour. Ridgeway’s Filter Unit Rockbags have been successfully used by a team from the Environment Agency and VolkerStevin, Boskalis Westminster and Atkins (VBA) for the Croston FAS Scheme. They provided a £9.4 million integrated flood risk management scheme working together with Chorley Council, Lancashire County Council and United Utilities. In June 2017 the scheme was completed and reduces the risk of flooding to 347 residential households and 91 commercial properties in the Croston Area. Ridgeway in collaboration with Japanese partner Sumitomo Corporation Europe provided over 1000 Kyowa Filter Unit Rockbags for this scheme. These were used on the outfall of the control structure in the storage basin to stabilise the banks. The Kyowa Filter Unit Rockbags were easy to fill, lift and place by an excavator, covering areas rapidly. They could be fitted onto uneven ground and filled any gaps well. The stone in the Kyowa Filter Unit Rockbags easily silts over the growth and was very well established after just 6 months at Croston. Kyowa Filter Unit Rockbags can be easily repositioned which makes them ideal for temporary works. In August 2016 the Croston area experienced very heavy rainfall. As a result, water levels in the river Yarrow rose significantly and the construction site was in danger of flooding. With the use of visqueen sheet wrapped around some of the Kyowa Filter Unit Rockbags they were able to form a bund in less than an hour. 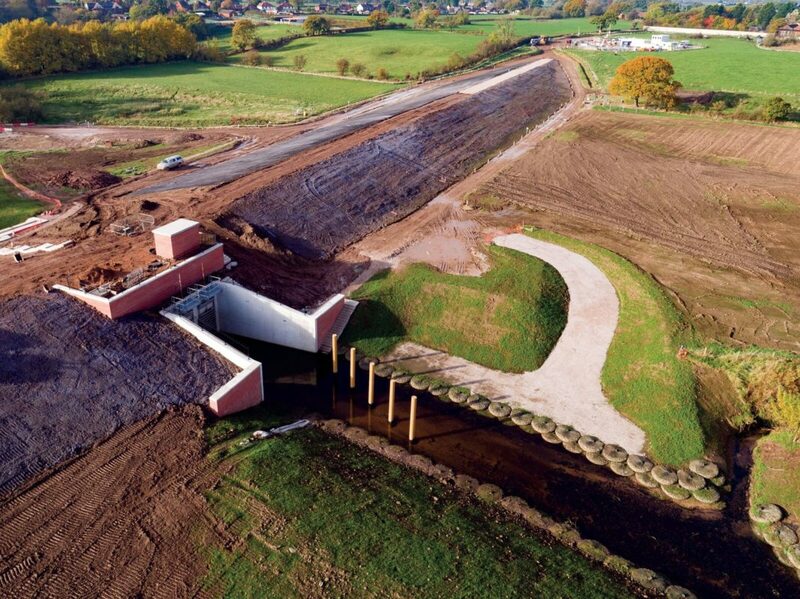 As well as protecting earthworks, this also reduced the risk of flooding to Croston, as the control gates of the new dam were not fully operational at this time. Richard Birchall, Project Manager, VBA JV Ltd. Team: Environment Agency, VBA JS Ltd. Email: Richard.birchall@volkerstevin.co.uk.